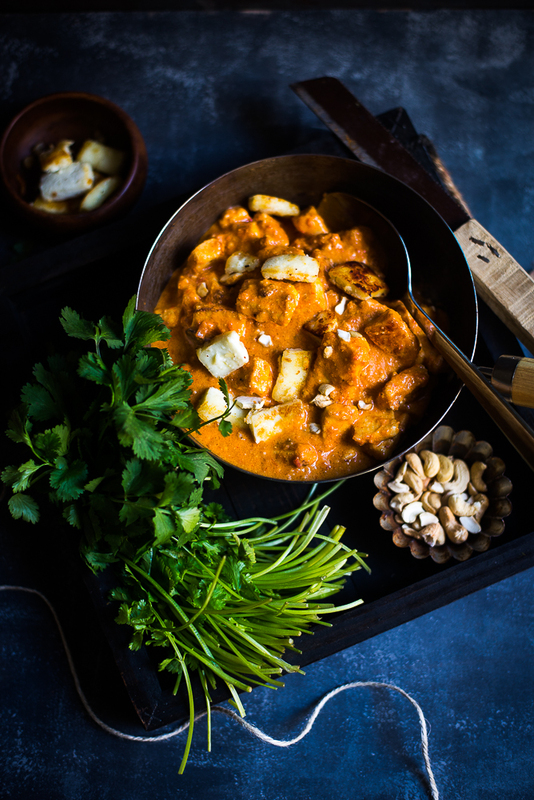 Paneer Butter Masala is a very rich Indian Vegetarian dish made with Paneer ( Indian Cottage Cheese ). 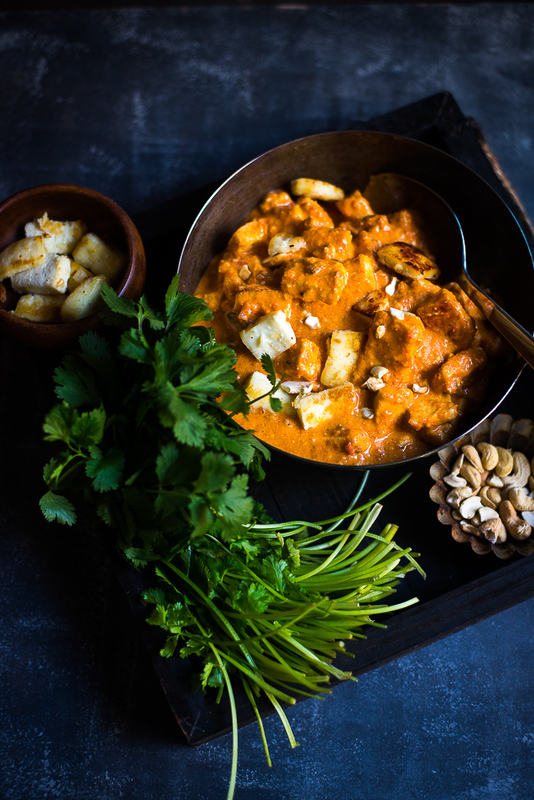 Marinated Paneer is cooked in a spicy, smooth and creamy red-colored tomato-based gravy. 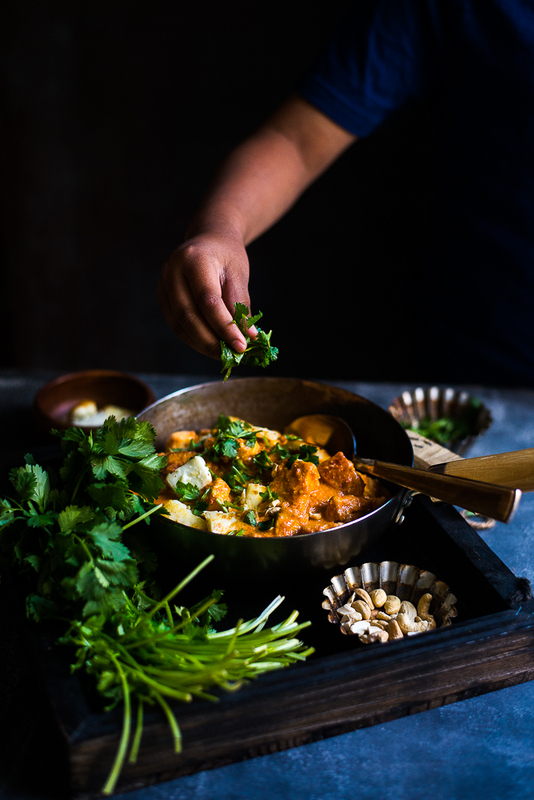 It’s the vegetarian version of Chicken Tikka Masala and the most frequent dish to order in an Indian restaurant just after Chicken tikka masala. It’s a bit higher on the calorie scale as the recipe uses lots of cream and butter. It makes this particular dish more appropriate for occasional treats. 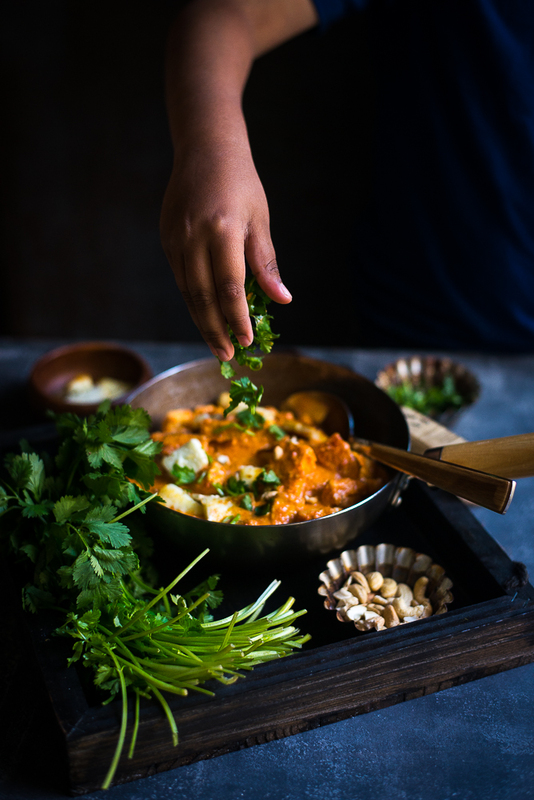 Today I will share the recipe of Paneer Butter Masala that you can include it in your everyday menu. Basically, my version of Paneer butter masala gives you the same creamy texture of the Restaurant’s recipe but with lesser fat. Instead of butter, I used here Canola Oil and replaced the cream with milk. 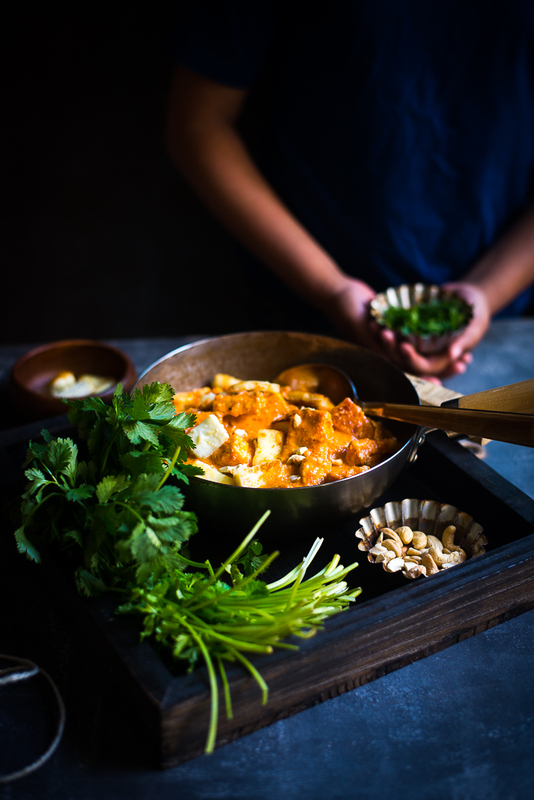 Not only it’s a healthy version of actual Paneer Butter Masala, but it’s an easy and fast recipe. Trust me it involves very little effort and needs about 20 minutes to complete the dish. Paneer Butter Masala pairs very well with most of the Indian Bread like Phulkas, Naan, Tandoori Roti, Paratha etc. 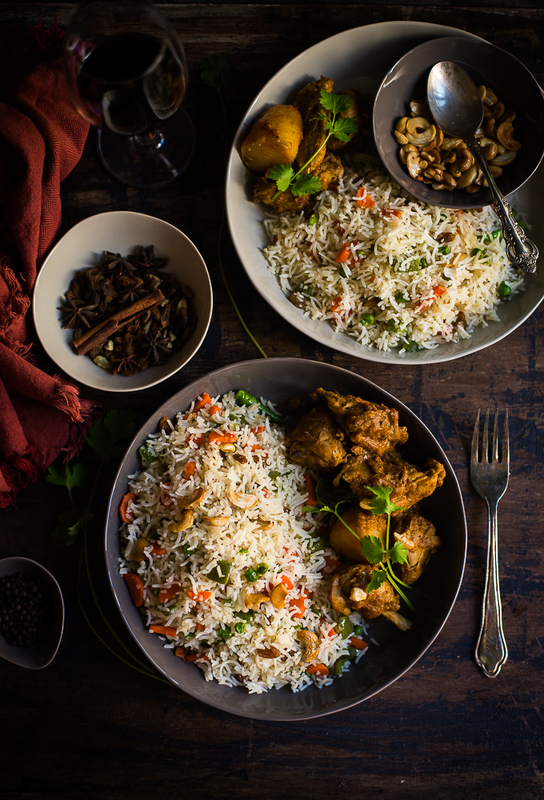 as well as with some Rice dishes like Pulao, Jeera Rice or even with plain rice. Milk: one cup or as needed. 1. sprinkle salt over the paneer pieces. Toss gently and set it aside. Take a pan, add oil to it and heat it up. Lightly fry the paneer pieces until they are golden color on both sides. Once they are done, set it aside. 2. Add the remaining oil to the pan, add fenugreek seeds. Once aroma comes up, either you can discard the fenugreek seeds from the oil or keep it as it is. But don't burn it. It will taste bitter if it is burnt. 3. Add green cardamoms, cinnamon stick and cloves to the oil. Once it sizzles, add garlic paste, ginger paste, and green chili paste. Fry it until raw smell goes off. 4. Add tomato puree to the pan. Stir it and cook for a couple of minutes. Once it becomes thick and the oil starts to come up from the sides of the pan, add Kashmiri red chili powder and coriander powder. Stir and cook it for another couple of minutes. 5. Add the cashew paste to the pan. Stir it to mix it nicely. Cook it again until oil separates from the spice mixture. Add salt and sugar. Add the crushed fenugreek leaves. 6. Add a cup of milk. You can add little more or less milk as per your desired consistency. 7. Once the gravy starts to boil, lower the flame and add fried paneer pieces to the gravy. Stir gently and cover the pan. Let it simmer for another 7 to 8 minutes. Check the seasoning, add salt and sugar if needed. Once the gravy reaches your desired consistency switch off the gas. Paneer Butter Masala is ready. Garnish it with chopped Coriander and serve hot with your choice of Indian bread or Rice preparation. Bengali Chutney is little different in taste from the Chutney of other parts of India. It’s not a condiment, rather in Bengali Cuisine, Chutney is a side dish and a part of a meal. It’s served at the end of a Bengali meal just before the dessert. It tastes usually sweet and sometimes a combination of tart and sweet with a hint of spicy. Most of the Bengali Chutneys are made of seasonal fruits like tomatoes, mangoes, pineapple, papaya or a combination of fruits and dry fruits. 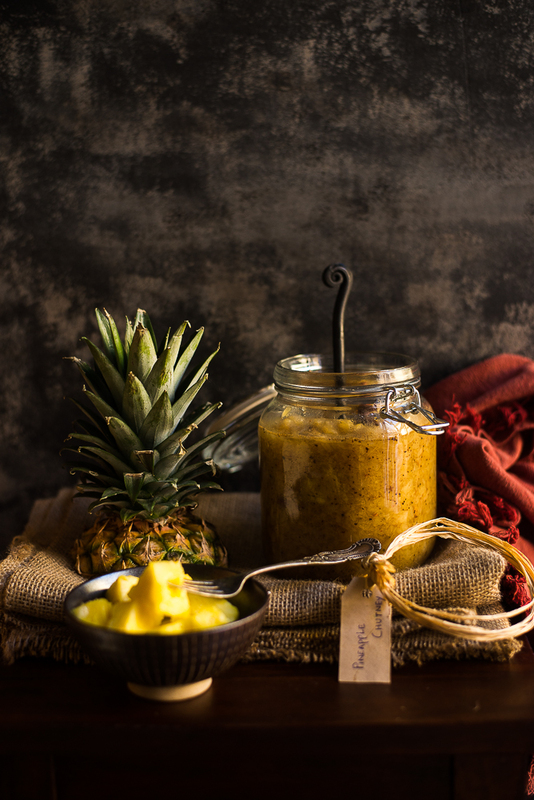 Today I will share the recipe of Pineapple Chutney, that I cooked for a potluck party where everyone liked it. So thought of sharing the recipe here. This is really easy and quick one to prepare. The taste is sweet and a bit spicy, perfect to complement any lunch or dinner menu. 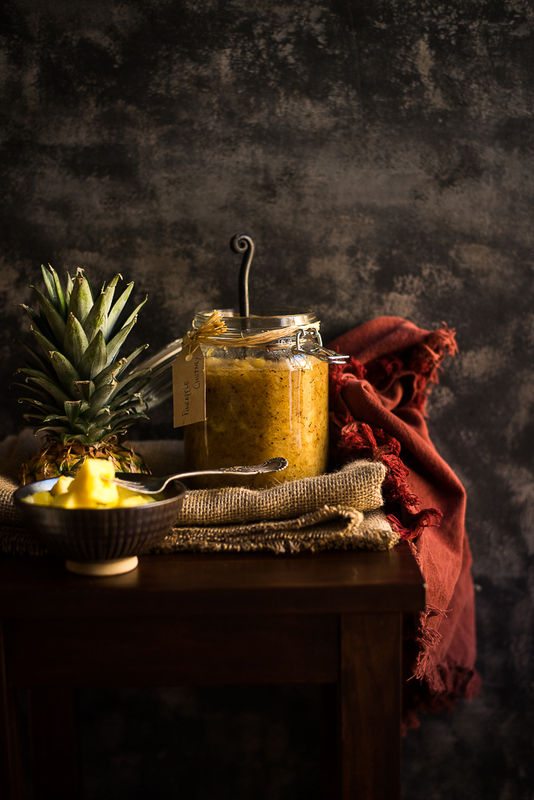 I have used fresh pineapples here but the canned pineapples will also work well here. 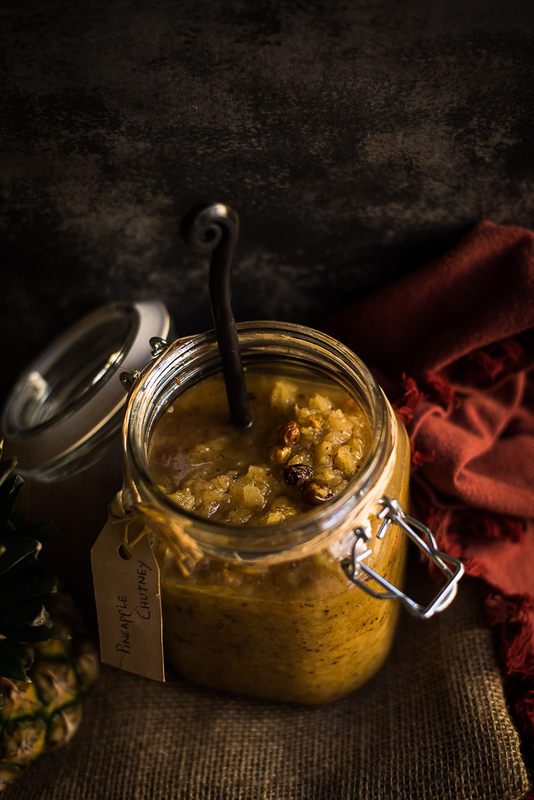 So if you are a Chutney-lover, do try this recipe and enjoy it until licking your fingers clean. 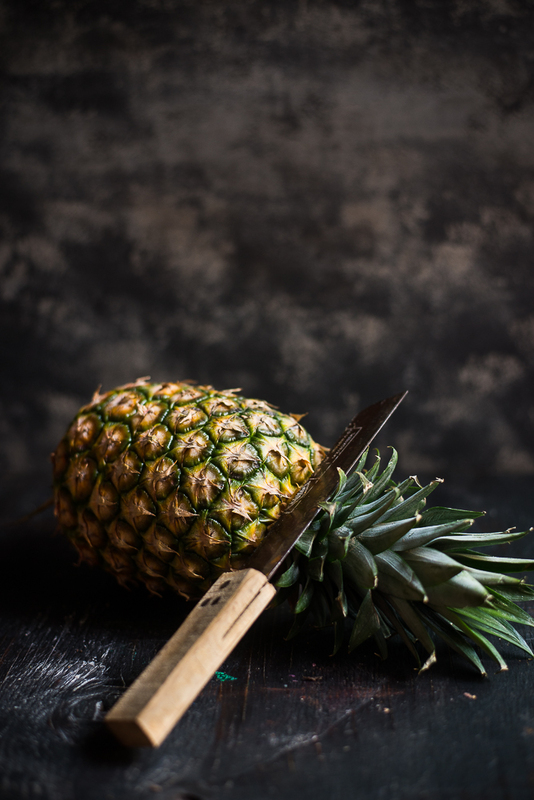 Pineapple: 2 cups, peeled, cut into small pieces. 1. Heat the oil in a pan, add panchphoron and the whole red chili. Once they start to splutter add the pineapple. Add salt and turmeric. Stir it for 4 to 5 minutues on a low heat. 2. Add 1 and a half cup of water to it. Add the sugar and raisins. Cover the pan and let it simmer for 15 to 20 minutes. Once the pineapple becomes soft and the sauce is at your desired consistency, check the sweetness. Add sugar if needed. Turn off the gas. Add the roasted spice powder and mix it well. Serve it as a side dish with a meal. Every family has their very own heirloom recipes that have been handed over from one to another generation. Today I will share a recipe that is our family favorites from my grandmother’s time. Whether it’s someone's birthday celebration or an anniversary get together, the recipe was always a big hit at our home. 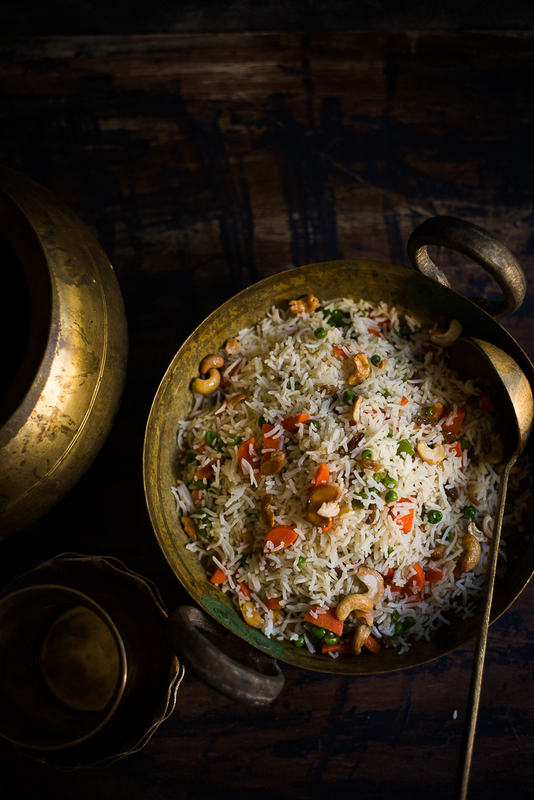 This is a mildly sweet and fragrant rice dish, loaded with some vegetables, dry fruits and ghee. This is not an elaborate dish rather it’s a very simple, and quick to prepare. 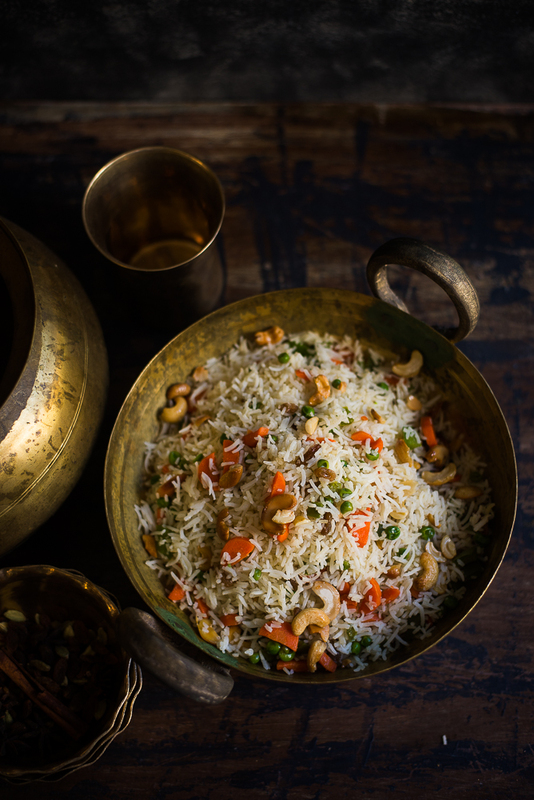 In this recipe, an assortment of spices, veggies, and dry fruits are first sautéed in oil and ghee. 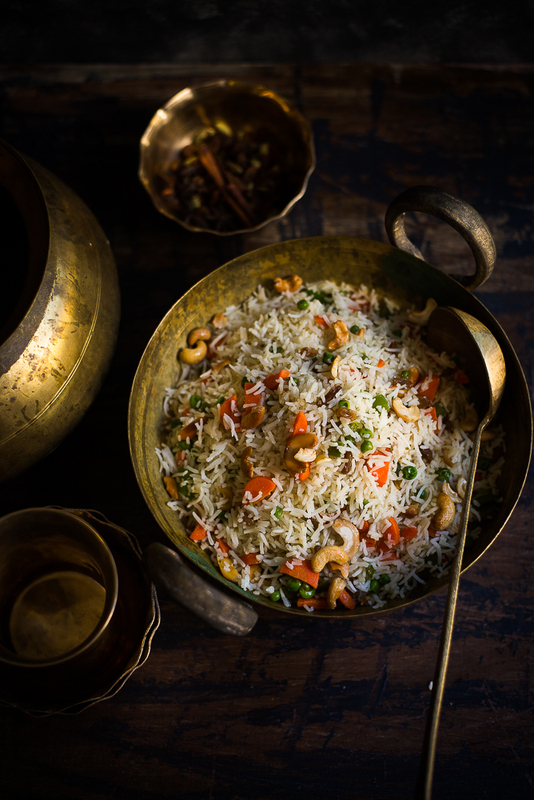 Then cooked rice is added to the mixture of vegetables and dry fruits. After few minutes, add salt and sugar to the rice and it’s ready to serve. It pairs well with a rich dish like Kasha Mangsho - chicken or Mutton cooked on the slow fire, in the Bengali way. Carrots: one cups, chopped into small cubes. 1. Cook the rice in a big pot. Add salt to it. Once the rice is 90% cooked drain the water from the rice. Spread the rice on a flat surface and let it come to the room temperature. This helps to prevent your rice from being sticky. 2. Soak the cashew and raisins in a cup of water separately. Take a big pan, add oil to it. Fry the cashew until they are golden brown. Once they are done, take it out of the pan and set it aside. Add raisins to the pan, and fry for a few seconds. Be careful, they burn so fast. Once they puff up, take it out of the pan and keep it aside. 3. In the same pan add 2 tablespoons of ghee. Add the whole spices, like green cardamoms, cinnamon, cloves and add the bay leaves. Once the aroma comes up, add the vegetables. Stir it and cook for a couple of minutes. Add salt to it and keep stirring. Add the green chilies. Once the vegetables are just cooked, add the rice. Stir it to mix it well. Add the remaining ghee. Add salt to taste and add the sugar. Again mix it well. Taste it to check the salt and sugar. It will be mildly sweet. The balance of sugar and salt is the important part of this dish. Once you are happy with the taste. Switch off the gas and serve it hot with a Chicken Curry, or Mutton Curry or with a veg dish like Aloo r Dom, Malai Kofta or Sahi Panner.